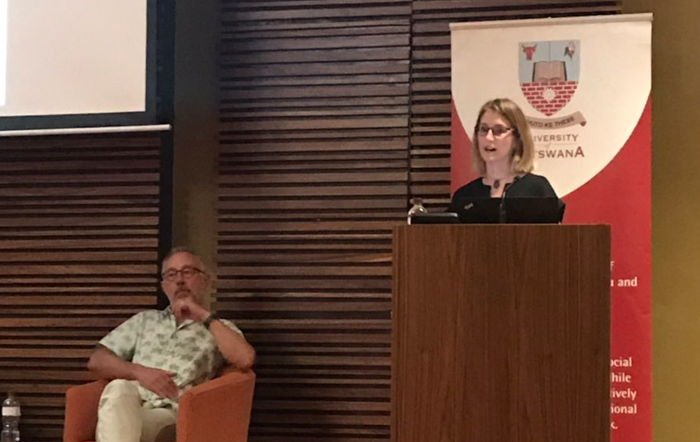 Researchers from the Universities of Oxford and Botswana hit the road on a journey to tell Kalahari Desert communities about the rich archaeological heritage that lies beneath their feet. Photos: (above) Dr Sarah Mothulatshipi and UB graduate Tópó Çhëñgétã explain how and why lake levels have changed to representatives of the Gweta Village Development Committee; (below, right) the team take questions after talking to more than 600 students at Nata secondary School about environmental change, prehistory and why archaeology matters. Dr Sallie Burrough and Professor David Thomas together with Dr Sarah Mohulatshipi from the University of Botswana spent two weeks talking to community leaders, school children and local guides in the Makadikgadi region of Botswana. Through community meetings, school talks and open lectures they directly reached over 1000 members of the public, telling the remarkable story of Kalahari megalakes and the stone age people of the Makgadikgadi salt pans. The team, which includes two students from the University of Botswana, hope to assist community protection of the region's rich archaeological heritage and inspire a new generation of climate scientists and archaeologists within Botswana. This public engagement work was kindly funded by the University of Oxford PER SEED fund, a British Geomorphological Society Outreach grant and the Trapnell Fund. "After years of work in the Makgadikgadi salt pans, it has been wonderful to share our discoveries with the public. The enthusiasm and interest shown by those who we met, demonstrates a real hunger for local historical and scientific knowledge. 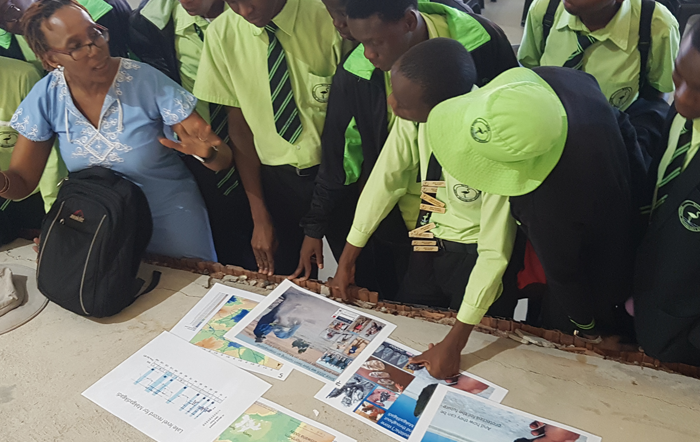 A series of public information boards, which we intend to install in the coming year, will help further raise awareness of Makgadikgadi's rich yet currently hidden heritage." Photo: Community leaders gather at Nata Sanctuary to discuss how the team's research can be of benefit to local people.